Sub level 21 is actually a Bunker that is part of the Cheyenne Mountain Complex. Originally it was accessed from outside the main entrance along a short road that skirted the Mountain from the main gate. It has now been connected to the base via a long tunnel from level 28 (the gate room) and is in fact five measured levels below that. It had been used for various things over time, the most memorable of those usages was when young Cassandra Fraiser was thought to be a danger to the base and accompanied down into that dark hole by Samantha Cater. Once through the tunnel, it was another 3 minutes down an elevator to reach their destination. As promised, the coffin was already waiting for the two men as they arrived. "So Doc, what's the protocol from here? Do we don full MOPP gear or something?" It was a little unnerving for William to know that they were in this location due to the potential explosive nature of what they were about to happen. The one thing Jay enjoyed about his work, was being in the company of intelligent and bright people, it kind of helped him feel that he wasn't as bad as he thought he was; perhaps a reward in some way. He knew that even to have managed to stay with the Stargate Program this long must mean something, even if Jack O'Neill wanted to kick him out more than once. Sam Carter was the one person he was grateful to for him still being here on that score. As the two of them made their way to twenty one, Jay reflected on all he had done. Maybe it wasn't as much as people like Sam, McKay, Selenka and even Bill Lee; but he had done some remarkable things in his time. Troy's question made him pull up with a start, that very question he had the answer to was one of his own babies..it should have his name on it. "Oh...um, yes. We have these now. Light weight fully articulated HAZMAT suits, you can even go EVA with them for a few minutes if need be." He walked a few meters away to a pair of large metal doors, entered a code and the doors slid open with a hiss. "HAZMAT suits MKII, they wouldn't let me name them." He looked sad at that remark. The medic let out an appreciative whistle. They looked impressive, and he was sure the Stargate program wouldn't invest in something that didn't work. If they worked as well as stated, he could see several applications along the line of search and rescue. Of course they would likely be quite costly, but perhaps a scaled down version would be just as useful. "Well hopefully we won't have to test out the EVA feature of them. You may have been shut out of the official naming, but have you tried using a nickname in place of HAZMAT suits MKII. Sometimes they stick better than the formal name. For example, most people call the A-10 a Warthog when the offical title is a Thunderbolt. Plus HAZMAT suits MKII is quite the mouthful." "I wanted to call them Ironman. Of course that got nuked barely before it was out of my mouth." Jay said as he began stripping down to his short and Tee shirt. "You know ess gee four has already tested them for EVA, they gave them a big thumbs up. 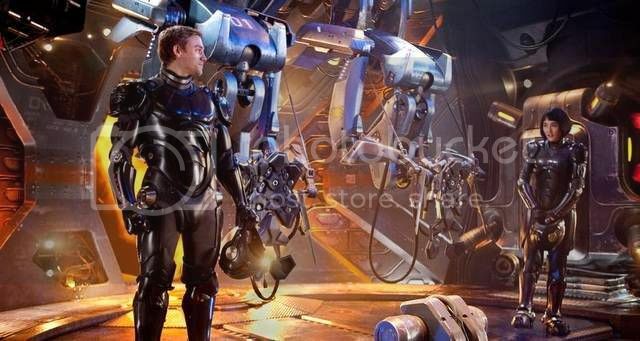 Lieutenant Colonel Ovcharenko so far holds the record of seven minutes, now if we can somehow get a better rebreathing system in miniature size we could almost do away with the bulky suits we have now." He keyed in on a pad sizes, weights and of course gender, William was roughly the same as Jay (he'd lost a few pounds over the years on Teal'c's insistence that he gets a little fitter), then two suits popped out on a hydraulic ram dangling above them. "Our next version is for Atlantis to replace the diving suits they use to inspect the city beneath the water." He said proudly. "Hmmmm, what about HAZU2?" "Yeah, I think Marvel would have something to say about that name. HAZU2 is certainly easier to say, of course I'm not the best expert when it comes to name. In the field I go by many different job titles, none of which are the official title. Doc, Medic, Corpsman, Flyboy. As long as it's not, hey you." He followed Felger's example by stripping down to his undergarments. "Five minutes is a good start, although if you want to beat a SCUBA tank you'd have to increase that number about 9 times over." He didn't even include the hardshell diving suits, he had been exposed to them during training but that's as far as it went. "If you need some help with the water tests, let me know. Not sure I'd want to be the one in the suit, but I could provide support as both a lifeguard and medic." 'Hissst...hiissst.' The sound of air being purged through the suit was quite loud in this cavernous space when Jay had his suit fitted on and the helmet in place. He was now on a radio for easier communication. "Colonel Carter said the same thing. I didn't think though it'd get beyond Stargate Command, but she was insistent that I don't even say the word, especially within range of General O'Neill's hearing." Now was the moment when they found out just exactly what was in the box, he was still speaking though as he walked towards it. "One of the really cool things about all the stuff we've found over the years was trinium. We will have a tank pack for the suit, might lighter and less bulky as well....I'll take you up on that." He chuckled. "Now where was that mechanism I saw earlier?" Jay walked around the coffin thing several times, bending down to look beneath the edges of the lid. He knew it was a trick device, you had to use two hands he thought to open it. William climbed into his own suit, and tested out the range of motion. He wasn't about to go sprinting into a combat zone with it on, but for the task at hand it seemed well suited. "You say it's HAZMAT rated, I'm assuming it helps protect the wearer against CBRN." He followed the scientist over towards the alien artifact. "Let's hope the mummy's curse didn't attach itself to the contents of whatever is inside." Being what and who he was, Jay was momentarily distracted by William's question, he stopped what he was doing to answer in the best way he knew how. "Crash test dummy 101. We tested it at a remote site along with the mark XI nuke. Both worked perfectly, although I would be the first to admit I would not wished to have been in said dummy's shoes so to speak." Admittedly the dummy was some forty kilometers away from the center of the blast, but it did survive all requirements. Something clicked, completely by accident as it were. Jay had both hands under the formwork of the lid, there must have been a double activated latch there as his fingers pressed inwards; a release of air was heard, air that was so old that perhaps even the Goa'uld had not awoken when this same air was locked in. There was a smell to, a musky smell of something which would have made you think instantly of evil, dark evil so overpowering you would quite possibly lose your lunch or breakfast, whichever the case might be. Of course neither Jay nor William could smell that. "Well how about that?" Was Jay's first reaction as the lid partially opened. Whether from its age, or simply that this was just nothing more than a coffin for someone, it didn't open automatically like the Goa'uld vessels did. Jay tried to lift it on his own as it was obviously hinged at the opposite side, but he failed. "William, can you give me a hand with this?" He grunted as his arms strained to lift the dead weight of the lid. "Good to know. I kind of figured that was the case, but you know what they say. Better safe than sorry"
William moved forward to help the scientist lift the lid off of the coffin. His second day on the job and he was playing archaeologist with was most likely an Alien who had been entombed for an untold number of years. Even if he was able to tell his old unit what had occurred, they most likely wouldn't believe him. He instinctively winced a little bit when the lid was lifted, expecting it to be booby trapped somehow. Nothing happened, so once the lid was placed on the ground he took a look at what was inside. The mummy filled most of the interior and had on a golden burial mask. What stood out about the mask was the grotesque look to it, almost as if the person underneath it died a very painful death. A large jeweled pendant hung around the mummy's mask, but at least to the medic it didn't provide any clues. "What do you think Doc? This is more your area of expertise." "Yeah I thought you'd appreciate that aspect of it." Jay replied nonchalantly, he was busy studying the figure in the coffin/sarcophagus at that moment, yet his thoughts were still with his temporary teammate. He liked that thought, it reminded him of the time he saved SG1, well he sort of did, O'Neill would put it another way. "Well, that pendant thing is interesting, I've not seen its design before, but at a guess I'd say it could be Alteran maybe, Doctor Jackson would have to analyse it for us to be sure. One thing though, just from the outline of the body, that thing or whatever it is, was much larger than any normal human. I thought at first a Unas, but the head, even with that elaborate mask is way to big. At least now we can get a look inside the bindings to see what it is." His hand hovered over the pendant for a moment, one of the links was already broken so it wouldn't take much to retrieve it. The thing was, that in itself could be a trap, or worse, some device activated once touched. "I'll need to get a couple of scanners to check that thing. Hmmm I wonder if we should get the Admiral down here now we've got this far?" Troy raised a quizzical eyebrow although it couldn't be seen very well through the helmet. "It's your call Doc, but in my experience you don't bring in the Brass unless there's a problem or you have definitive answers to give them. So far we don't have either. You said it's not an Unas, whatever that is, and that the necklace could be Alteran but that's just an educated guess. In my opinion we should continue our investigation before looping in the Admiral." The man was right, in the short time Jay had known the Admiral he would be less than impressed if presented with a half done survey, let alone a meaningless piece of information that told him nothing. "Right, I'll get some gear sent down and we can see what we're up against. I've burned my fingers on alien tech before today, so I'm not gonna rush into this without the proper tools." For a few moments he wandered around the huge coffin object weighing up in his mind just exactly what they'd need. "Okay, I've got it. We can have the Oddy pick up my stuff and beam it down. I've got everything tagged so it shouldn't be a problem for them." Jay tapped his radio coms, speaking rapidly for more than a minute, a little confusion added with a couple of heated words from him, then the hum of the asgard beam saw his entire trolley from his lab appear next to them. "Boy, they call themselves smart!" He at least now had everything he had. "William, we need to do some scans, get some readouts. Grab that grey device there on the top, its an Ancienty thing, it'll analyse most everything." Especially if there is any residue energy signals from that pendant. Jay himself picked up another device, a small hand held x-ray machine, one that would give him a piece by piece picture of what was under the wrappings, which could be then assembled in a computer to give them a 3D image. In a way he felt like he was back in med school where you were asked to get data from a patient, but not fully understanding what the readings mean, or what the experts were looking for. Troy picked up the gray device, and slowly ran it back and forth over the body laying in the coffin. "So this device takes readings, where is the information sent to?" Jay was already busy at work with his side of things, but the man never begrudged another co-worker his help when needed and he was kind of warming up to William, he seemed like a decent guy. "Flip it over William, those ancient folks were way ahead of us with LED screens, which is pretty much what that blank space is until you touch it with your finger. We've had both Sam Carter and Rodney Mckay patch up a translator program for them. That's the little hard lump you can fell on the top edge." He did take at least one breath. "Its all in English now." Going back to his work, Jay was now uploading his own scanned images onto his laptop, turning his head on a slight angle to see each frame displayed as he did so. One by one they began building a 3D image, by the time it was all put together Jay stood there with his mouth hanging open. "Whaaat the...?"